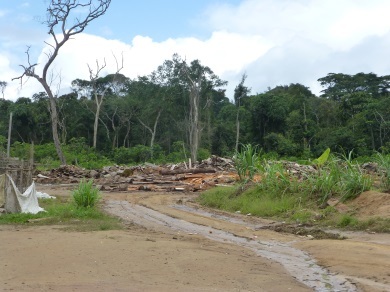 Driving along the road from Kribi town to Kribi port I notice the project owner RAZEL has already started enlarging the road, turning it into an even worse mud trap than it was before. I am glad I decided to rent a car to take us to the Bagyeli settlements. 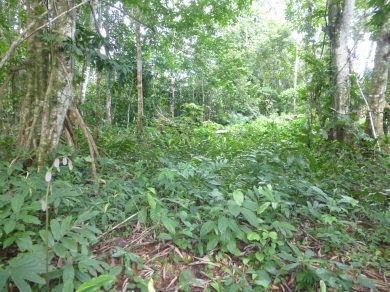 The first Bagyéli settlement I visited, Bibira, is actually a replacement for their former grounds. 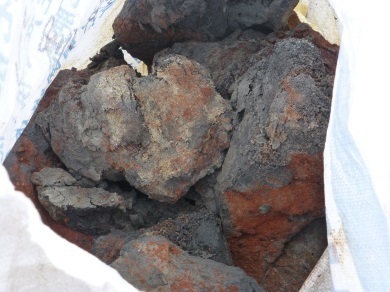 Whilst building the harbour, China Harbour Engineering Corporation (CHEC) found ore in the Bibira area which is currently being exploited. The Bagyeli were given the option to leave the area voluntarily or under the supervision of the Bataillon d’Intervention Rapide (BIR). This special army division was created in 2001 by the Cameroonian government to put an end to the hostage-taking and looting by criminal gangs (a.k.a. coupeurs de routes) operating on its eastern borders with the Central African Republic (RCA) and its northern borders with both Nigeria and Chad. Since its inception the BIR has also been used to intervene when riots like the ones in Douala and Yaoundé in February 2008 arise. 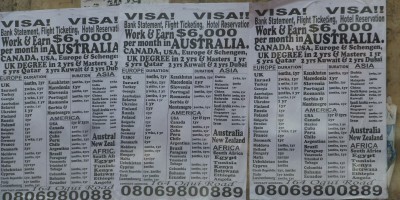 In Cameroon the mentioning of BIR is the equivalent of mentioning the boogie man to a four year old. I have heard many terrifying stories about these men dressed in black who apparently do not think twice to remove any insurgence by whatever means deemed necessary. 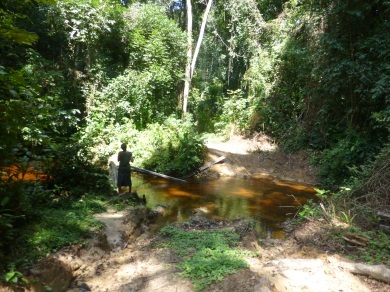 The Bibira (re)settlement finds itself some three kilometres further down the road from its former outer border. CHEC built four wooden houses for the group. 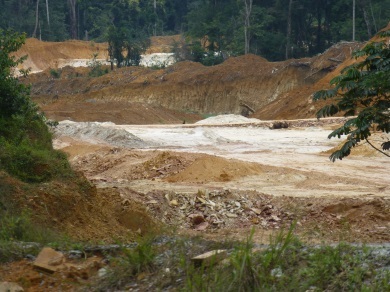 Placed between a timber exploitation site, the afore mentioned ore exploitation site, the harbour and the dumping ground for a yet unknown waste material. They claim the waste brings with it more mosquitos, and pollutes their drinking water. A CHEC representative came to warn them that from now on they would have to boil their water before drinking it. But as they perceive this as being too bothersome, they drink the water as is. Even the children, which resulted in high fever for the youngest child there. They took the infant to the Ebomé hospital for (free) treatment. The Ebomé hospital is a Spanish NGO from Lanzarotte, providing cheap or in the case of the Bagyeli free treatment. The transport to and from the hospital is free for all. Finding themselves cornered between the resource extraction sites and the building of the harbour, which conversely is being done 24/7, the noise level is considerable during the day, let alone at night. All of the people present complained about not being able to sleep properly. The constant noise also causes the animals to flee from the area, making hunting a cumbersome activity taking them three or four times as far from their site as before. 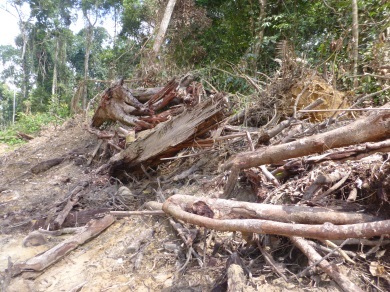 Even then they find many of their traps destroyed by either timber extraction employees or mine prospectors. The latter dig holes here and there in search for ore. They agreed to take me in the forest to show me the signs the mine prospectors leave, since they could not tell me the name of the company searching for ore. When I asked them what activities they undertake to make up for the fact that hunting no longer suffices to provide them with daily sustenance, they answered that they sometimes prefer to sell their bush meat to get money to buy food at the market or from neighbouring farmers. Their skills as medicine men also provides them with some revenue. From earlier conversations with people everywhere I know that they are seen as powerful healers. As one man claimed that before the Western medicine came, people lived to be more than a hundred years because they went to “les Pygmées” who are masters in herb lore. Their current site is only temporary. After an indefinite time they are to leave for Lolabé 3, a planned urban centre some 10 km further down the road. None of them think it will be an improvement, since they will be staying there on the fringe of the city and the city is prospected to grow five fold over the course of as just as many years. Combined with the surrounding industry they are sure there will be no animals in the area. When I asked if they had any questions at the end of the interview, they were vehement about me taking the message that they would implore any and all to hear to build them a school with Bagyeli teachers, as can be found in Bipindi and Lolodorf. They are convinced the reason why they suffer such hardships is the fact that none of them speak, read nor write French and that they thus cannot speak for themselves with any voice people understand nor understand what others are speaking to them. 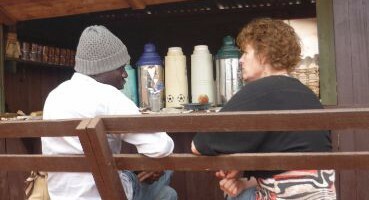 The second site, Meboua, was a sharp contrast to the Bibira replacement. Although the half an hour trek began with an as depressing sight as I met at Bibira, it got replaced quickly by dense forest and intense quiet (if one does not count the insects buzzing and causing all sorts racket). 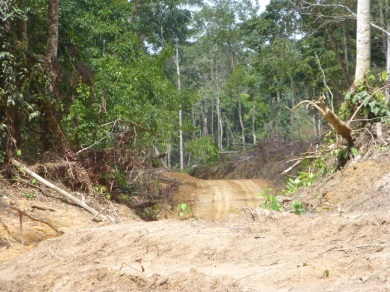 The entrance to the forest has been the site of timber extraction to clear the afore mentioned 30,000 ha needed for the construction of the harbour and accompanying industries. Knowing this, some people (Bantu) took advantage of that knowledge and bought as much terrain as they could to cash in their profit. One of these people, when buying the terrain, forced the inhabitants of Meboua to look for another site. 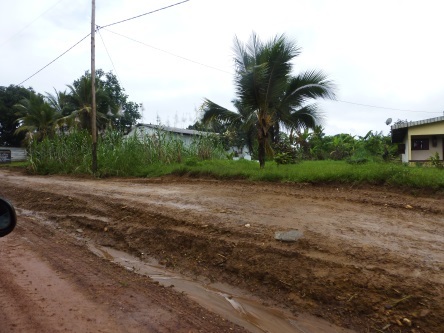 The Meboua settlement has 4 houses and a field on which they grow manioc. The settlement consists of three Bagyeli families and one Bantu man and his wife. The atmosphere was relaxed and the people looked far better nourished than those in the other settlement. When asked if they experienced a lot of interference from the new harbour or in their dealings with CHEC, they agreed that they had in fact not had any dealings with CHEC at all and that their lives were pretty much as they were, even though they were approached by people from CAM-IRON informing them that some iron ore was found in the area and that they were going to have to leave their settlement somewhere in the “near future”. To the whereabouts of that site, they have no idea. They also reported not to have been to any of the meetings, because they were not notified of any. What they were told however was that CAM-IRON was to compensate them with an alleged 2 billion CFA. The rumour spread and attracted the Bantu family to share in the compensation. When two of the Bagyeli went with us to get the fish, rice and salt I brought, they told us they were not happy with their new “neighbour” because even now, with the food given to them, they would have to share. Because of the mistrust I sensed, I decided to leave taking pictures of the people and their homes (maybe) for a later date, not wanting to overstep any intimacy boundaries, when there is not yet an intimate rapport. The pictures that I have taken as shown above are from the areas directly surrounding the four wooden houses and from within two meters with my back to them.